We’ve integrated production workflow to optimize efficiency and cost-effectiveness, giving our resellers an even more pronounced leg up on the competition when it comes to selection, service, speed and savings. What’s in a label? Whatever you want, thanks to the just-formed strategic partnership between Discount Labels and Lancer Label. But don’t take our word for it. Click here to get a free pass to ASI Chicago, and check out the nation’s largest selection of custom label solutions at Booth #1624. 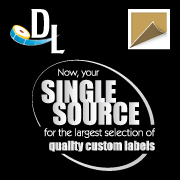 Together, Discount Labels and Lancer Label continue to offer a national network of resellers quality, service, speed and value to which they’ve become accustomed. “We’ve integrated production workflow to optimize efficiency and cost-effectiveness, giving our resellers an even more pronounced leg up on the competition when it comes to selection, service, speed and savings,” notes Brian Webb, National Director of Strategic Accounts. Discount Labels, already selling through the largest authorized label distributor network in the US and Canada, is now expanding with addition of Lancer Label. Lancer Label’s strong customer service reputation and printing versatility mesh well with Discount Labels’ corporate culture and capabilities. The strategic partnership will strengthen Discount Labels’ existing position as America’s largest wholesale label supplier.